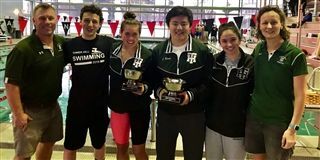 Congratulations to the boys’ and girls’ swim teams on winning the 2019 DISC Championship on Saturday, Feb. 2. Neither team had won the DISC Championship in more than 15 years. During the meet, Tower Hill students set nine schools records, two DISC records and two pool records. Coach Sharon Reynolds was also voted DISC Swimming Coach of the Year by her peers. Congratulations!